What did H.R.1 symbolize? The Democrats’ long history of attempting to maximize short-term political benefits for the dominant faction of one political party—themselves– by placing significant and very burdensome restrictions on free speech. H.R. 1 was billed by its supporters as acting as a curb on election corruption, but is itself a type of corruption – an abuse of the lawmaking power, by which incumbent lawmakers employ the threat of criminal sanctions, among other deterrents, to reduce the amount of private speech regarding the actions of the lawmakers themselves. The bill would codify a vague and expansive definition of “the functional equivalent of express advocacy,” that applies to communications that “when taken as a whole, it can be interpreted by a reasonable person only as advocating the election or defeat of a candidate for election for Federal office.” There is little that an organization could say by way of commentary on the votes or positions taken by an incumbent member of Congress that would not fall within this expansive definition, in the eyes of some “reasonable person” – most often, an annoyed incumbent lawmaker or his operatives. In short, this would significantly curb the ability of our organization to let our supporters know when prolife votes occurred or where an elected official stands on abortion. In addition, the bill would require expansive disclosure of donors by organizations like National Right to Life, our affiliates, and chapters thereby infringing on the rights of those donors in their exercise of free association. National Right to Life was not alone in its criticism. The Constitution requires a healthy respect for associational privacy. In NAACP v. Alabama, the Supreme Court recognized that “[i]nviolability of privacy in group association may in many circumstances be indispensable to preservation of freedom of association, particularly where a group espouses dissident beliefs.” For that reason alone, we should be very cautious when contemplating invasions of that privacy. Because the [bill] would expose the private associations of an overbroad number of donors, it fails to respect this first constitutional principle. Despite the backlash from advocacy groups from all across the political spectrum, H.R. 1 passed on a party-line vote with 234 Democrats voting for the bill and 190 Republicans opposing it. The bill then went to the U.S. Senate, which according to statements of Senate Majority Leader Mitch McConnell (R-Ky.), is not expected to take up the legislation. 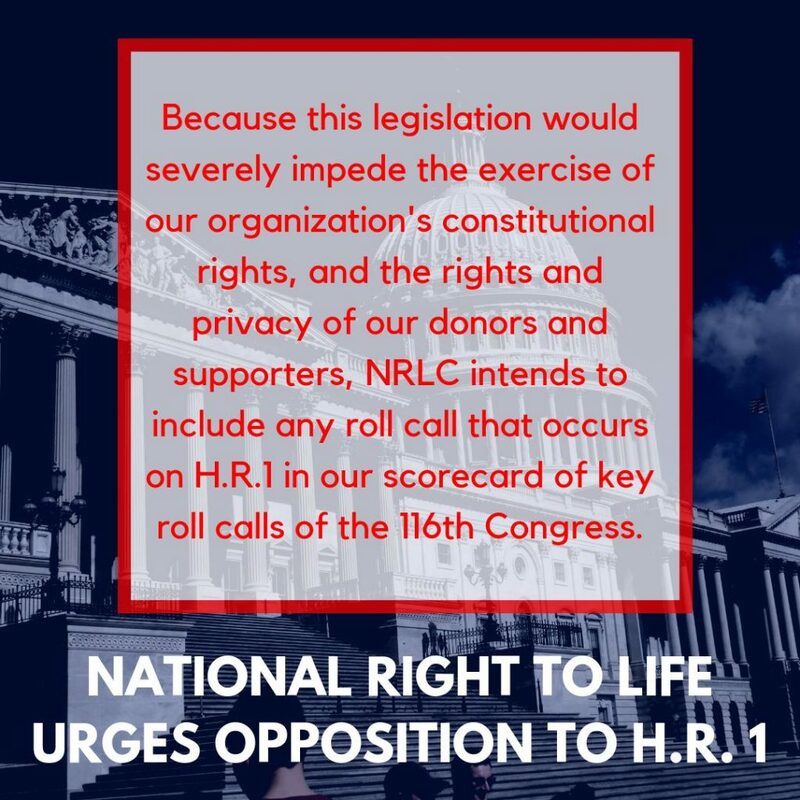 Amidst the public outcry stemming from the extreme abortion agenda being promoted in several states, pro-life Members of Congress are urgently renewing their effort to end abortions late in pregnancy and are calling to increase protections for babies who survive abortions. The widely-criticized “Reproductive Health Act” was signed into law on January 22 by New York Gov. Andrew Cuomo (D). Among other provisions, the law repealed protections for infants born alive during an attempted abortion. Previously, New York law stipulated that a second physician be present to care for a child 20 weeks or older born alive during an abortion. Adding to the mix was embroiled Virginia Gov. Ralph Northam (D). Speaking about a now-stalled measure in the Virginia legislature, Northam indicated during a radio interview that, in his view, an infant born alive during an attempted abortion wouldn’t necessarily be entitled to immediate treatment. This is tantamount to infanticide. With several very similar extremist measures pushing through New Mexico, Rhode Island, Vermont, and Maryland, the response from Congress has been decisive. While the House remains under pro-abortion Democrat control, Minority Whip Steve Scalise (R-LA) announced that he will file a discharge petition to consider H.R.962, the Born-Alive Abortion Survivors Protection Act. A discharge petition is a tool that the minority can use to force a vote in the House of Representatives if it is signed by a majority of members in the House (218). The legislation is sponsored by Rep. Ann Wagner (R-MO). Until the discharge petition becomes available (likely in early April) pro-life Republican leaders have gone to the floor of the House on each legislative day since Wednesday February 6th to ask for unanimous consent to consider H.R. 962. So far, 16 House members have sought these requests and Democrats have objected each time. These requests are expected to continue every legislative day for the foreseeable future. In early April, members of Congress will be able to begin signing the petition to circumvent Speaker Nancy Pelosi (D-Ca.) and bring this bill for a vote.